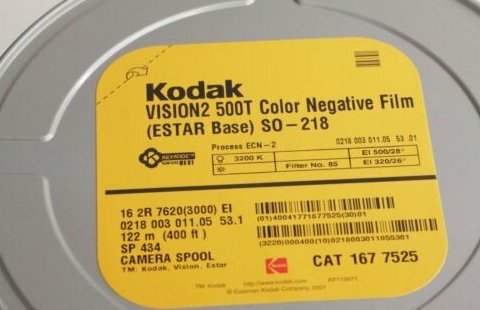 The only film I've ever shot entire projects on is 35mm and 16mm Vision 3 (as well as experimenting with some expired Vision 2 stocks). I've never heard of this ESTAR base film before. Any one have any knowledge on this? Also, any idea how it might hold up? - seller says it was stored cold and is factory sealed. Of course, I'd test it ahead of any real shooting, but I'm curious if any one has any idea if it's worth it before I buy the lot? Could be fun to do it regardless as it is selling for fairly cheap! Attached is a photo of the label - curious that it doesn't even have a film code starting in "7." Could this be an experimental stock? Yes, fast stock for high-speed cameras. Polyester base withstands the bigger forces in those cameras. It is on a 400" spool and is long pitch perforated; if you have a camerajam with polyester stock, you camera may be damaged. It's on a daylight spool, double-perf, which is necessary for high-speed, but it's very odd- we never used polyester because as Dirk says a jam at high-speed would be disastrous. You would want the film to break. We actually used a vacuum cleaner to clean out the film chips from a camera run-out. SO-218 is the special order designation for 7229 double-perf, Estar base, on a daylight spool. Standard for 16mm was single-perf acetate on a core.